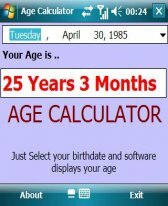 Software calculates age on selecting birthdate. The software allows easy to pick date through calendar picker. Very good and decent bold interface for clear viewing. I have restricted age to year and months display. I would really appreciate your suggestions and comments.